we take the same system with a powerful vacuum, lightweight poles and video cameras. to their expected life span, as well as considerably enhancing the safety of your property. Contact Us now for a free quotation. 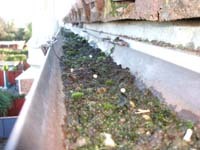 Domestic prices start at £45 for the first 12 metres of gutter cleaning. Blocked downpipe(s) cleaning is additional, as is unblocking drainage etc and we can also carry out gutter and downpipe repairs. We start with a survey using a wireless video camera (see above), shows us exactly what is in the gutter and its condition. 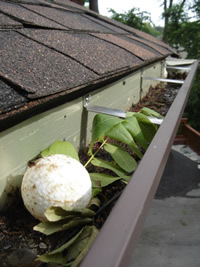 We would recommend a clean up for the gutters asap. All of our equipment is maintained to a very high standard and we will always take the greatest care when cleaning. Connect up the system and start cleaning. The vacuum system is safe for both wet and dry materials and can hold around 30ltrs of waste. A generator is available if access to mains power is an issue. Finally, we connect up the video camera again and check the gutters are thoroughly clean, we are investigating using a recording device this will allow us to provide clients with a data/ time stamped video showing the work carried out. Interested? Contact Us now for a free quote. High reach Gutter Cleaning Surrey Hampshire Berkshire- yes!